1000 PLA Lined 1 lb Coffee Bags 4-1/4x2-1/2x10-1/2"
1/2 lb 3.5 x 2.5 x 7.75" 1 lb 4.25 x 2.5 x 10.5"
1 lb. PLA Lined Natural Brown Kraft Tin Tie Coffee Bags by the bulk carton. Perfect for coffee beans or grounds, tea leaves, cookies, candy, donuts, dog treats and more! 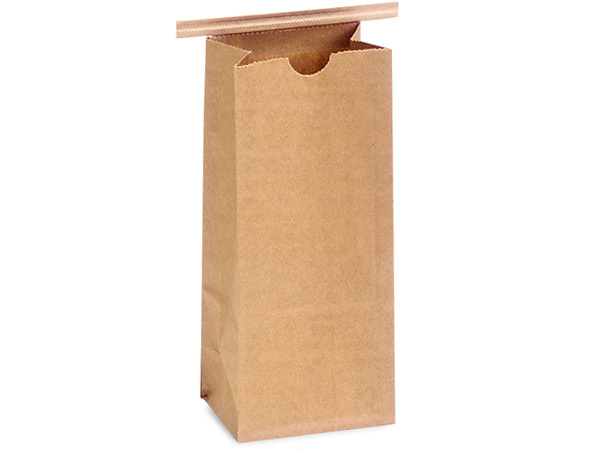 Made from 50# basis Natural Kraft paper with PLA liner and tin-tie closure. Works well as small gift bags, rustic decor party favors or crafting! Compostable and recyclable once tin-tie is removed. Complies with FDA regulations for food packaging. Our 100% compostable, after the removal of tin ties, Kraft Tin Tie Coffee Bags meet ASTM D6400, EN13432 standards for CA and other states. PLA (polylactic acid) Lined Bags are 40% recycled and are available with and without windows. Paper Lined Bags are available without windows only. Both options are made in the USA and are 100% compostable. Bags have flat bottom and easy-to-use tin tie closures attached. Complies with FDA regulations for food packaging. Just fill the bag, fold the ties in and they are ready to go!